To prove the viability of this technology, Okinawa Prefecture has built an OTEC demonstration facility at its Deep Sea Water Research Center on Kume Island, which lies approximately 100 km west of Okinawa Island. The island enjoys a subtropical, temperate climate throughout the year, with an average temperature of 22.7° C. In addition to the generation of electricity, the cold water from this facility is used in agriculture, aquaculture, and other industrial applications. An OTEC system utilizes the temperature differences between warm surface seawater and cold deep seawater to generate electricity. Chlorofluorocarbon (CFC), a low-boiling-point working fluid, is pumped into an evaporator, where the transfer of heat from the warm surface seawater (normally 25° C - 30° C) to the working fluid causes the fluid to vaporize. The vapor drives a turbine to generate electricity. Then, the vapor is transferred to a condenser where it is returned to a liquid state as the result of the transfer of heat to cold seawater that has been taken up from ocean depths of 600 - 1,000 meters and is 5° C - 7° C. This OTEC technology is regarded as one of the most effective methods for utilizing the ocean's thermal energy, and it is most suitable in tropical and subtropical regions, where the temperature differences between deep seawater and surface seawater is the greatest. There is considerable interest in capitalizing on OTEC's potential as a clean, renewable source, and rapid progress in the research and development of practical applications of this technology is being made in Japan and other countries. According to a Renewable Energy Technology White Paper prepared by the Japanese's government's New Energy and Industrial Technology Development Organization (NEDO), total installed OTEC capacity worldwide is expected to reach 510 MW by 2020, 2,550 MW by 2030, and 8,150 MW by 2050. The demonstration facility on Kume Island has an initial maximum output of 50 kW (expandable to 100 kW) and its dimensions are 9 m x 8 m x 8 m. CFC is used as the heat medium. All electricity generated by this facility is used by the research center. The goals for this facility are to obtain data that will show how reliable the technology is and predict its performance in a commercial scale operation, and to demonstrate its ability to operate continuously for long periods of time. Data is also being collected on the fluctuations in output caused by changes in air and water temperature. The insights gained through the analysis of these results will be used to improve the designs of commercial-scale plants. Together with IHI Plant Construction Co., Ltd. and Xenesys Inc., Yokogawa Electric Corporation submitted a proposal for the Okinawa prefectural government's Fiscal Year 2012 Experimental Deep Seawater Power Generation Project. 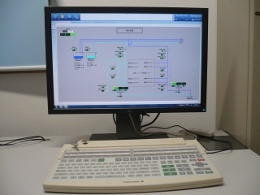 Upon attaining project approval, Yokogawa successfully delivered, installed, and commissioned the CENTUM VP production control system (PCS) and a variety of field instruments for this demonstration facility. To most effectively utilize the heat energy stored in the ocean water, the operation of the OTEC facility's water intake, waste water, heat exchanger, and generator equipment must be carefully monitored and controlled. 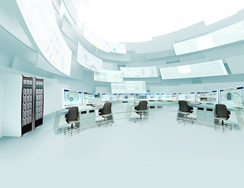 The CENTUM VP PCS and field instruments installed by Yokogawa help to keep this facility operating stably and generating power at peak efficiency. As this is an experimental facility, the control strategy must continually be refined while the plant is in operation. Changes to multiple PID control loops also necessitate frequent software changes. With CENTUM VP, it is possible to do this without disrupting the operation of the facility. The acquisition of data and its analysis are also important. CENTUM VP not only facilitates the collection of this data, it automatically saves it in standard format files for use in the analysis process. "Okinawa Prefecture is mainly dependent on imported fossil fuels. In order to promote the use of clean energy and improve its energy self-sufficiency, the prefectural government is carrying out these field trials on Kume Island to demonstrate the practicality of ocean thermal power generation. We are also exploring multiple uses for deep seawater. I hope that ocean thermal power plants can enter commercial use, and that other industrial uses can be found for the deep seawater, thereby promoting the development of industry. That is the Kume Island Model." 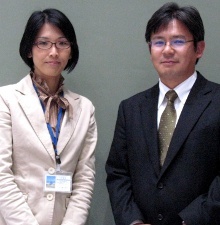 Katsuya Furugen and Motohiro Nagamine of the Okinawa Prefectural Government, Department of Commerce, Industry Policy Division. "Ocean thermal energy conversion is the core element of the Kume Island Model. In the future, we plan to rely on ocean thermal power generation to meet baseload power demand, and aim to develop solar and wind power so that we can meet 100% of our energy needs with renewable energy. That's why we are engaged in this experiment. In addition, we are looking for other ways to make efficient use of deep seawater. For example, even after it is used to generate power, it is still cool enough to be used to chill soil and enable the growth of spinach and other kinds of produce. As declared at our "Island Yuntaku" conference, We will continue to engage in activities by which we will benefit from our ocean resources and create a bright future for our island." "When we first used CENTUM VP, we were immediately impressed with how easy to use it was. Using the keyboard, we could quickly call up the screens we wanted to see, and could easily access other screens from the alarm message screen. Operating the demonstration facility was stress free. We hope to keep working on such projects with Yokogawa Solution Service Corporation. We want to play a leading role in spreading the use of the OTEC technology." 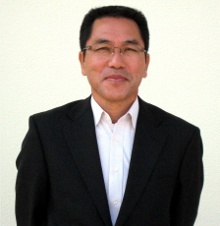 Shin Okamura, Deputy GM of Xenesys Inc.